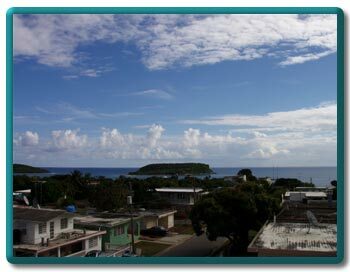 Located in Barrio Esperanza at 347 Calle Tintillos, Casa Jenny offers Stateside convenience and easy access to all the action and beauty of the famous Malecon... Vieques Island's focal point for celebration and just plain hanging out! The home is comprised of 2 generous size split level 2 bedroom, 1.5 bath apartments, one downstairs and one upstairs. Both have private entry as well as their own covered roof top patios complete with view of the Caribbean. With completion in Jan '06, the original home was gutted, more than doubled in size with additions at the rear and totally modernized, right down to the cherry cabinets & 36" digital TV's with satellite dish and Internet access! 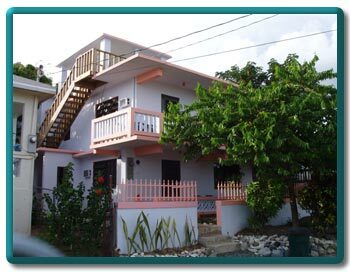 The home is 2-1/2 short blocks from the Malecon... making it possible to enjoy your stay on Vieques Island without having to rent a car. You can walk to the restaurants, shops & cafes as well as to the beach that is adjacent to the Malecon's commercial area. Less than one block away you will find a small colmado (grocery store), a bakery/pizza shop & a chicken restaurant. Want to explore the beaches or outlying areas? Local taxis are abundant and will take you anywhere you wish for a reasonable fare. If you do wish to rent a car, our Links page will lead you to all the car rental companies. 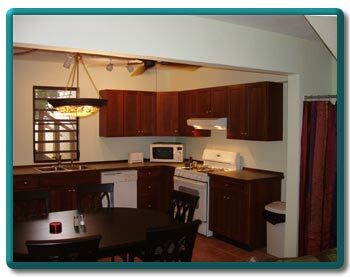 Downstairs Dining Area / Kitchen The home's furnishings, appliances & fixtures are of good quality. Sheets and towels are all high quality 100% cotton. Both units are tiled including first floor front porch, second floor balcony and second floor's Casita roof patio. There is a covered roof top patio for each unit, each with its own private stairway. Upstairs unit has a bathtub with tile surround. Downstairs unit has a large walk-in tile shower. Both units have their own washers & dryers in a separate laundry/sitting area. There is an abundance of shelving & clothes hanging areas throughout the home. Nearly all lighting is on dimmer switches for that "just right" ambience. Unlike most Vieques offerings, the all-new windows are glass, not metal slats which tend to make rooms somewhat gloomy at times. 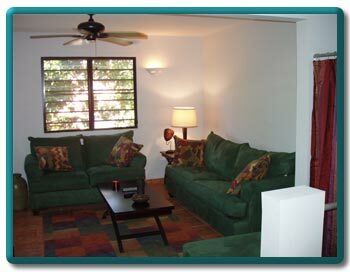 Great rooms and bedrooms all have ceiling fans and the bedrooms have window air conditioning units. The Esperanza neighborhood is a safe one and the neighbors are friendly. Feel free to stroll about. Other rentals are sprinkled throughout the village and the locals are used to visitors. Esperanza lets you experience island living more as a resident than as a tourist. The sights and sounds of everyday life here are of roosters crowing, geese making sounds like a squeaky gate, the occasional visiting iguana and people living the free & easy island life. Upon request, you will be greeted at the airport or ferry by our very capable & good natured manager, Kikito, who will help you get settled in and be available if you need assistance. Sorry, no smoking; no pets. No children under 10.